This week the AAPD continues to celebrate National Children's Dental Health Month by collaborating for two separate and fun Twitter chats on how to protect those little teeth. You won't want to miss either chat on how to get children to brush their teeth and enjoy doing it! Check out additional details on both chats below! On Tuesday, February 23, the Kids’ Healthy Mouths campaign will hold a Twitter chat to celebrate National Children’s Dental Health Month with cohosts Momfluential, HaveSippy and Teeth Fairies. AAPD President-Elect Dr. Jade Miller will be serving as the pediatric oral health expert on the chat. The chat will focus on how parents can win the #BedtimeBattle with the 3 Bs: Brush, Book, Bed. Tips will be shared for structuring children’s nighttime routines in a healthy way (including brushing for two minutes) that helps them get to sleep. Please plan to participate and weigh in from your organization’s handles! Together, we can win the #BedtimeBattle for healthier children and happier parents. This National Children’s Dental Health Month, be sure to join us for a Twitter Chat as part of our national campaign to raise awareness of the importance of children’s dental health. To participate in the chat, follow the hashtag #LittleTeethChat and @AmerAcadPedDent on Twitter tomorrow, Wednesday, February 24 at 8 p.m. ET. AAPD will host the chat with expert help from AAPD national spokesperson Dr. Mira Albert of Hinsdale, Ill., and co-host AAPD Parent Ambassador Susan Carraretto of 5 Minutes for Mom. During the chat, Dr. Albert and Susan will engage participants on Twitter through questions, anecdotal stories, and tips from AAPD. The chat will focus on the importance of early dental visits, establishing a Dental Home and tips for keeping children’s mouths healthy and "Monster-Free." Dr. Albert and Susan will also answer questions from parents and caregivers on oral health, ultimately raising awareness of AAPD as a resource for parents and caregivers as the big authority on little teeth. 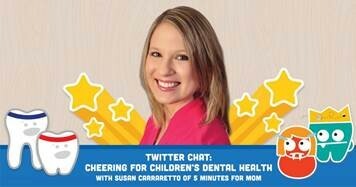 To join the chat or follow along, be sure to follow AAPD and Dr. Albert at @AmerAcadPedDent and Susan Carraretto at @5minutesformom and use the hashtag #LittleTeethChat.